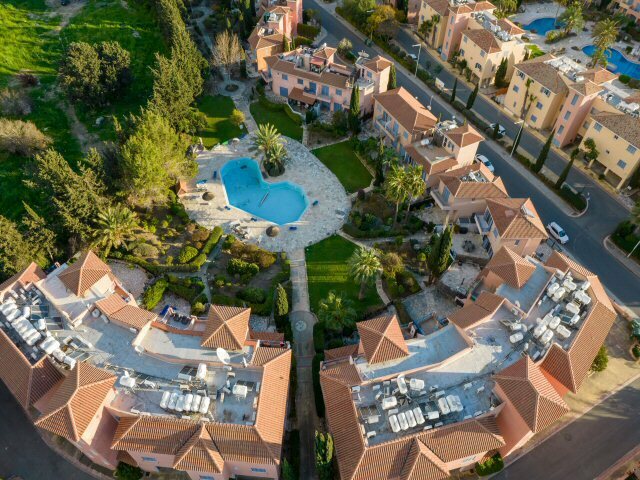 This four bedroom villa is located on this popular complex in the heart of Kato Paphos. It has a private pool, WiFi and UK TV. Occupancy - Eight people. For an additional person a z-bed can be hired for a small charge paid locally. Pool - The private pool and terrace are very secluded, furnished with table and eight chairs and eight sunloungers. This is the perfect place to relax and enjoy alfresco dining. You also have full access to the main complex pool. Living Room - Air-conditioned, lounge seating for eight, dining table and seven chairs. Kitchen - Breakfast bar, washing machine, fridge/freezer, hob/oven, toaster and kettle. Bedroom 1 - First floor, air-conditioned, double, ensuite full bathroom, fitted wardrobes, separate dressing area, pool facing balcony with table and two chairs. Bedroom 2 - First floor, air-conditioned, double, fitted wardrobes. Bedroom 3 - First floor, air-conditioned, twin, fitted wardrobes. Bedroom 4 - First floor, air-conditioned, twin, fitted wardrobes. Bathroom - First floor: bathroom with bath, shower and WC. Ground floor: WC and washbasin. Additional Features - Free WiFi, alarm system, hairdryer, iron and ironing board. July 2018 - Loved the villa, very spacious and clean, good facilities, would definitely recommend. The pool area was great and couldn’t have done without it. Only 5 minutes walk to Alexander the Great Hotel, where we attended a wedding. Good local restaurants within a 10 minute walk. Good service from property management, had slight problem with the TV which was sorted within a couple of hours. Thoroughly enjoyed our stay. April 2018 - Excellent for big families. We enjoyed our family holiday all 17 of us in three different properties on the complex. Comfortable beds. Near to coast to walk. Good Cypriot Restaurants on the front that are close by. Enjoyed our stay very much. Thank you for making it possible. The Property Manager was excellent in dealing with our internet problem which was sorted quickly. Restaurants we liked were Phivos, Viva Cyprus, and Romeo. Tea for Two a great favourite of the week. My personal favourite is Alkion. BBQs were the main of our meals as we could keep a low budget on the food. Tomb of the kings was a good visit but pick a cloudy day as it can get very hot. We have had a heat wave for this time of the year here. 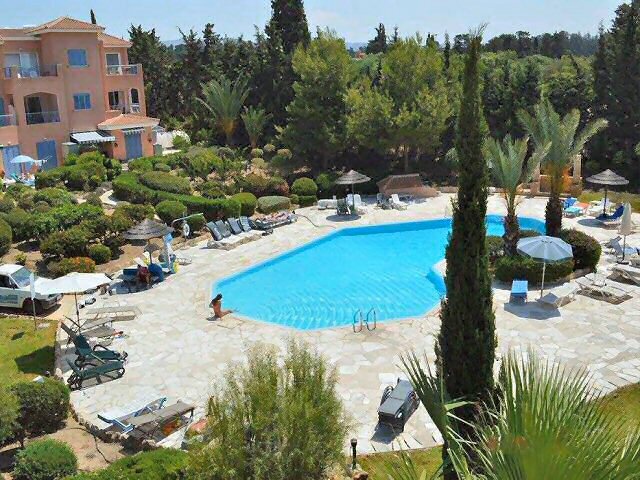 September 2017 - Excellent value for money, good sized pool and comfortable bedrooms with air conditioning. We had a great time all week. Great location, 10 minute walk from the main bars and restaurants as well as having a couple of quiet shops and restaurants just round the corner from the resort.